The instructions for the front twist were really confusing, mostly because the correct placement relies on two asterisks that don’t actually exist! I went back and rechecked the paper pattern, and nope, nothing. So I’m completely in Tany’s debt for providing some essential diagrams and photos, without which I would’ve had an AWFUL time unpicking and resewing that twist. With those photos, it was actually not very difficult at all. Laura’s knit tips also came in handy here, even if you think you know everything there is to know about knits already! I didn’t have a chance to buy narrow seam interfacing for the neckline since I’m on my strict sewing budget these days, but it’s definitely on the list to buy soon. 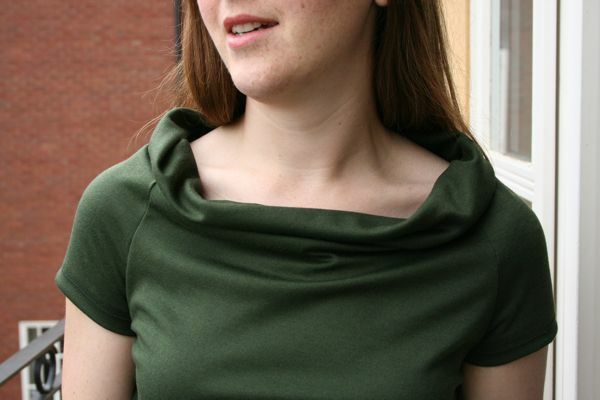 The olive green double knit was bought last summer in America for $3.95 a yard. It’s 60% rayon, 35% polyester, and 5% lycra, making this the first time I’ve ever sewn with the famous “RPL” I’ve been hearing so much about! It certainly won’t be the last, though, as it’s incredibly comfortable, silky to the touch, and doesn’t wrinkle in the slightest (the above photos were taken in our Norwich hotel room after the dress had been squished in a bag for a day). I didn’t change much in this pattern, but I did narrow the neck band significantly because a 9 inch wide one just seemed excessive and entirely too floppy (so I reduced it to 6 inches after folding instead). I also closed up the skirt wrap because as-is, the opening goes all the way up to the crotch and is WAY too revealing even without any help from a gust of wind. Since the wrap edges already have facings, it was a simple matter to just tack the facing of the right side onto the top of the left to get the drape laying right. And since it’s knit, it’s not like walking ease was ever going to be an issue! I often have to shorten Burda dresses so that they fall above the knee, but in this case it was already at my perfect length straight off the pattern! When this pattern was first revealed, a lot of ladies exclaimed that they’d never want to add a bunch of fabric onto their stomachs like the twist suggests, but having made this, I couldn’t disagree more. I’ve found this design to be incredibly waist-defining – the triangular side panels really pull in your waist and make this very slimming indeed. I think this dress would be a lifesaver for anyone with my former “straight up and down” figure. 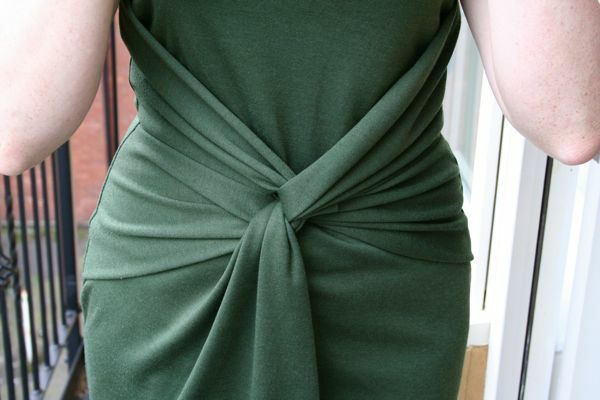 Separator image Posted in Gallery and tagged with bwof, dress, knit, S08.